The age of low cost, flexible electronics is dawning at Duke University where researchers have developed a digital memory device using an aerosol jet printer and nanoparticle inks. Analogous to a 4-bit flash drive, the device is said to be the first fully-printed digital memory that would be suitable for practical use in electronics such as environmental sensors or RFID tags. Jet-printing the device at relatively low temperatures means it could be used to build programmable electronic devices on pliant materials including paper and plastic. “We have all of the parameters that would allow this to be used for a practical application, and we’ve even done our own little demonstration using LEDs,” said Duke graduate student Matthew Catenacci, who describes the device in a paper published online in the Journal of Electronic Materials. At the core of the postage stamp-sized new device is a new copper-nanowire-based printable material that can store digital information. “Memory is kind of an abstract thing, but essentially it is a series of ones and zeros which you can use to encode information,” said Benjamin Wiley, an associate professor of chemistry at Duke and an author on the paper. Most flash drives encode information in series of silicon transistors, which can exist in a charged state, corresponding to a “one,” and an uncharged state, corresponding to a “zero,” Wiley said in a statement. The new material, made of silica-coated copper nanowires encased in a polymer matrix, encodes information in states of resistance. By applying a small voltage, it can be switched between a state of high resistance, which stops electric current, and a state of low resistance, which allows current to flow. Unlike silicon, the nanowires and the polymer can be dissolved in methanol, creating a liquid that can be sprayed through the nozzle of a printer. “We have developed a way to make the entire device printable from solution, which is what you would want if you wanted to apply it to fabrics, RFID tags, curved and flexible substrates, or substrates that can’t sustain high heat,” Wiley said. According to Duke University, Catenacci created the device by first using a commercially-available gold nanoparticle ink to print a series of gold electrodes onto a glass slide. He then printed the copper-nanowire memory material over the gold electrodes, and finally printed a second series of electrodes in copper. To demonstrate an application, Catenacci connected the device to a circuit containing four LED lights. “Since we have four bits, we could program sixteen different states,” Catenacci said, where each ‘state’ corresponds to a specific pattern of lights. In real-world applications, each of these states could be programmed to correspond to a number, letter, or other display symbol. 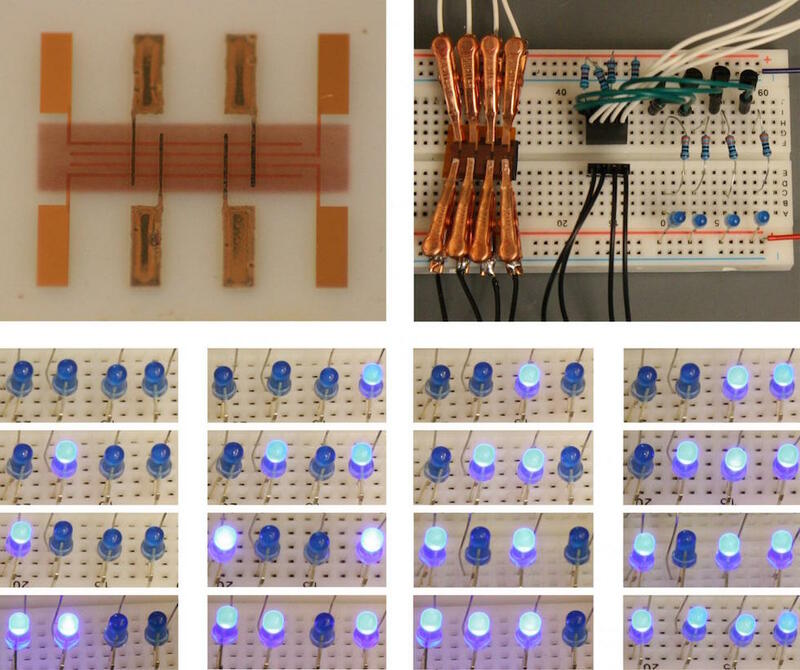 Other research groups have fabricated similar printable memory devices in recent years, but this is the first to combine key properties that are necessary for practical use. The write speed, or time it takes to switch back and forth between states, is around three microseconds, rivalling the speed of flash drives. Their tests reportedly indicate that written information may be retained for up to ten years, and the material can be re-written many times without degrading. Despite their small memory capacity, the devices could find applications where low cost and flexibility is key, the researchers said. “We have developed a way to make the entire device printable from solution, which is what you would want if you wanted to apply it to fabrics, RFID tags, curved and flexible substrates, or substrates that can’t sustain high heat,” Wiley said…SO does it stick to human skin?